UH Bauer students had an impressive showing at this year’s CME Group Commodity Trading Challenge, claiming six of the top 10 spots. Six students from the Finance Association at the University of Houston C. T. Bauer College of Business shouted their way to the top of the competition against students from schools across the nation this weekend during the annual CME Group Commodity Trading Challenge in Melcher Hall. 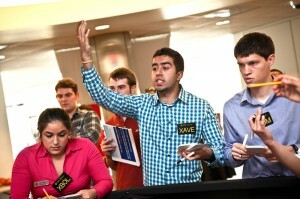 Organized by the student organization and hosted March 31 in Melcher Hall, the open outcry competition required students to test their ability to buy and sell oil contracts using the traditional trading terminology and fast-paced hand signals. Bauer students made up more than half of the top 10, with Blythe Perez taking the third prize of $500, Sameed Gagai taking fifth place, respectively, and Alyson Quintana, Ben Barr, Pete Watson and Lateef Frierson rounding out the top 10. The competition is a simulation of the “open outcry” method that commodity traders employ when executing orders. Participants learn about the how markets move due to the supply and demand of a simulated economy, trading crude oil and gas futures. To determine the winners, judges will assess the students’ use of fast-paced hand signals and shouting traditional trading terminology while listening and reacting to the changes in market. 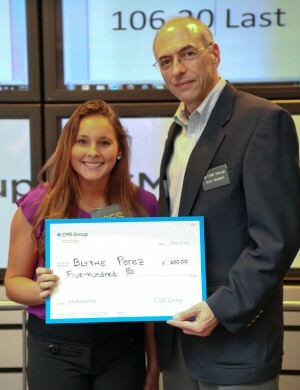 UH Bauer student Blythe Perez, left, claimed third place at the March 31 CME Group Commodity Trading Challenge held in Melcher Hall.